Here's what we know: This is an important photograph. Here's what we don't know: What's in the photograph. Everything seen here was wiped out in the 1928 St. Francis Dam disaster. All we know about this photograph is what we can see in it. 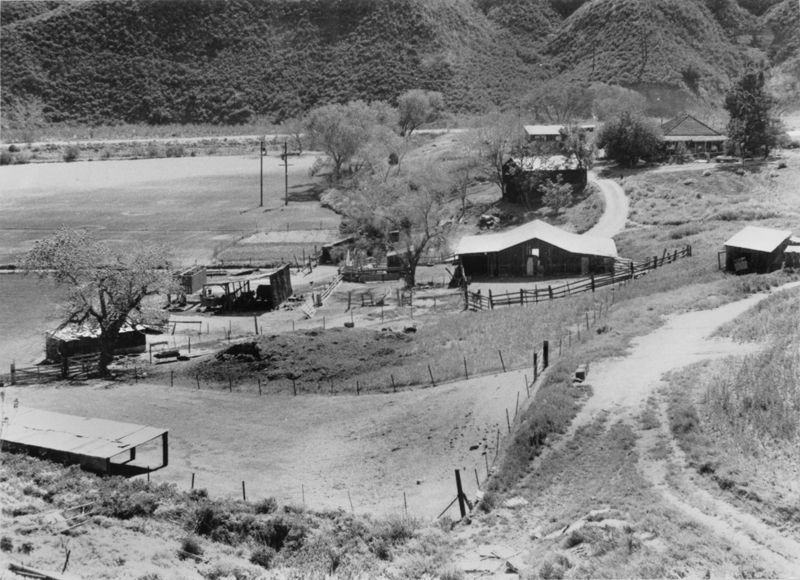 It's likely that this photograph holds the key to the location of the stagecoach station in San Francisquito Canyon, and possibly the Ruiz house, and more. We think we're standing at the edge of the Ruiz Cemetery (possibly before it first existed in 1888), looking due east. If that's the case, then this is part of the Perea property in San Francisquito Canyon. 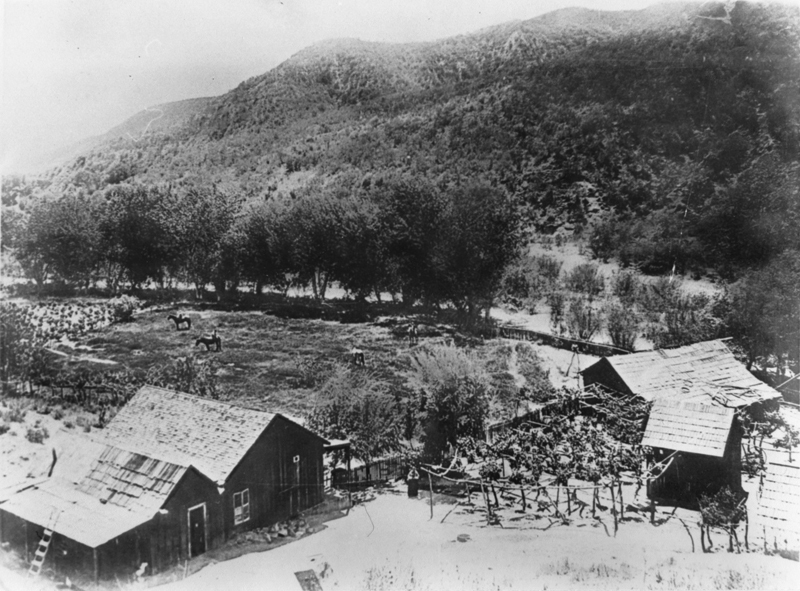 The corral in the foreground, then, would be the open space directly in front of the cemetery today. Look here. That would mean the one-walled structure to the viewer's left of the tree in the middle is the approximate location where the Ponton family erected its manufactured home in the 1960s (or, according to assessor records, in 1970). We'd like to think this photograph was shot in 1887 when this photo was shot, but if the two upright things at upper-middle-left are telephone poles, it can't be earlier than 1900. Maybe they're telegraph poles? There is a strong likelihood that one of these structures is Moore's (aka Holland's, aka Hollandsville) stagecoach station, which was in use from around 1854 until sometime in the 1880s. One of these structures — perhaps the house at upper right? — could be the Ruiz home. Or maybe it's the Perea home. Ramon Perea established the "Ruiz" Cemetery in 1888 up on the death of Perea's wife, Antonia, who wished to be buried on the hillside overlooking her home. It's possible there's a post office in here somewhere. If you can identify anything in this photograph, please contact us. AP1829: 9600 dpi jpeg from copy print.